The Second Ministerial Meeting of the Forum of China and Community of Latin American and Caribbean States (CELAC) will be held in Santiago, Chile from January 19 to 22. At the invitation of Foreign Minister Heraldo Muñoz of the Republic of Chile and Foreign Minister Hugo Martínez of the Republic of El Salvador which is now holding the rotating presidency of CELAC, Foreign Minister Wang Yi will lead a delegation to the meeting. He will also be paying official visits to Chile and Uruguay from January 21 to 25 at the invitation of Foreign Minister Heraldo Muñoz of the Republic of Chile and Foreign Minister Rodolfo Nin Novoa of the Oriental Republic of Uruguay. 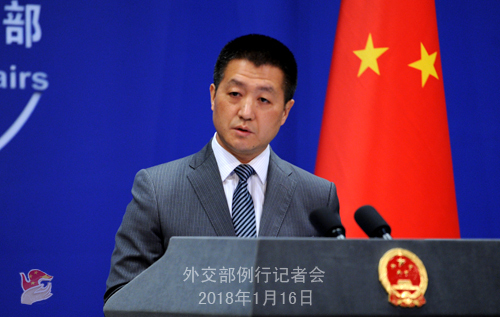 Q: Yesterday, the Iranian foreign ministry spokesperson said that China has offered maximum coordination with the Iranian side over the Sanchi oil tanker accident. We know that you've been responding to the relevant questions for many days. Do you have anything to add in light of the latest remarks of the Iranian foreign ministry spokesperson? How will China deal with the follow-up matters? A: China attaches high importance to the rescue work of the Sanchi oil tanker. The Chinese leaders ordered all-out efforts as soon as the accident happened. On the day the accident happened, China assembled nine vessels for search and rescue, and the number of rescue ships has maintained at 13 and above since the second day. We also coordinated with ROK and Japanese vessels and mobilized resources from Shanghai and Jiangsu. The Iranian labor minister and ambassador to China arrived in Shanghai very soon and witnessed the whole process as China carried forward with its search and rescue work. The rescue teams sent by the Iranian side also arrived at the site very quickly. The Iranian labor minister said when he returned to Iran that China wasted no moment in putting out the fire and saving lives. As the Iranian foreign ministry spokesperson said, before the Sanchi oil tanker went down, both China and Iran were ready to board the ship, but aborted the plan because of sudden deflagration. In the case of such a complicated accident, it is not right to accuse China of holding back in its rescue efforts without going through necessary investigation. What is obvious at the moment is that China has offered the Iranian side all the necessary coordination to the best of its capability. The statements from the Iranian side also proved that the previous accusations against China's rescue efforts are wrong and irresponsible. As for the follow-up matters, the Chinese side has instructed relevant departments to properly handle them in accordance with laws and regulations. We welcome Iran's participation in the investigation and stand ready to help the family members of the victims get their visas and offer other conveniences. Q: US lawmakers are urging the US telecom firm AT&T to cut all commercial ties with the Chinese phone maker Huawei and are also opposing plans for China Mobile to enter the US market because of national security concerns. What is the Chinese government's response to this? A: At the Foreign Ministry's regular press conference, we rarely comment on specific cases of business cooperation. I am not aware of the details of the situation mentioned by you and I would refer you to competent authorities. I want to point out however that the Chinese government always encourages Chinese enterprises to carry out foreign investment and cooperation in accordance with market principles, international rules and local laws and regulations. Meanwhile, we also hope that relevant countries could level the playing ground and create favorable environment for Chinese enterprises. I would like to stress that the China-US economic and trade relations are mutually beneficial in nature, which has been proven by tons of facts. We hope that the two sides could make concerted efforts to maintain the sound and steady development of bilateral economic relations because this serves our common interests. Q: There is a meeting of foreign ministers happening in Vancouver about the situation on the Korean Peninsula. Does China regret not being invited? A: I already answered such questions. This meeting you inquired about has no legality and representativeness to speak of from the very beginning, and China is opposed to it from day one. It means nothing for us to talk about regret or not. 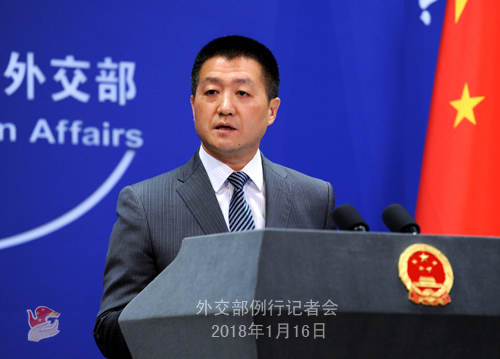 Q: Regarding Foreign Minister Wang Yi's upcoming attendance at the Second Ministerial Meeting of the Forum of China and CELAC, we would like to know more about this meeting and China's expectation for it. A: The Second Ministerial Meeting of the Forum of China and CELAC will be the first ministerial-level one to be held in Latin America, marking an important event for China-Latin America relations after China's 19th CPC Congress. You asked about our expectation. Foreign Minister Wang Yi will take this opportunity to engage with CELAC foreign ministers and discuss ways to promote connectivity, mutually beneficial cooperation, common development, innovation and cooperation. They will also have an in-depth and thorough exchange of views on international and regional issues of common interest and chart the course for the next three-year development and cooperation of the Forum. We sincerely hope that through this meeting, China and CELAC could work together to elevate the China-Latin America comprehensive cooperation partnership of equality, mutual benefit and common development to a higher level. I want to add that be it the Belt and Road Initiative proposed by China, or the framework of the China-Latin America comprehensive cooperation partnership, they are not merely empty words and void promises. Rather, they are supported by concrete cooperation projects. In fact, China and many Latin American countries are cooperating on productivity and infrastructure. There is no lack of examples on that. Q: Yesterday, Russian Foreign Minister Lavrov held his annual press conference, in which he talked about China-Russia cooperation on international and regional issues including the Korean Peninsula situation. What is your response to his remarks? A: China thinks highly of what Foreign Minister Lavrov said about China-Russia cooperation on international affairs and we agree with his positive statements. As comprehensive strategic partners of coordination, China and Russia have been closely and effectively coordinating and cooperating with each other on a range of major international and regional issues. We are all committed to safeguarding the purposes and principles of the UN Charter and the basic norms universally accepted for international relations, advancing the political settlement of hot-spot issues, and promoting the sound development of such mechanisms as the SCO and BRICS. China and Russia are also taking active efforts to further align the Belt and Road Initiative and the Eurasia Economic Union and advance regional economic integration. In the new year, China stands ready to work with Russia to step up coordination and collaboration on international affairs, make greater contribution to regional and global peace, stability, development and prosperity, and jointly move forward the building of a new type of international relations and a community with a shared future for all mankind. Q: The Philippine presidential office said that President Duterte has decided to allow a joint scientific research on the Benham Rise between China and the University of the Philippines. What is your comment? A: From January to February, China's scientific research vessel "Kexue" will be conducting marine research activities in waters under the Philippine jurisdiction east off the Philippine Islands. China commends this decision made by the Philippine side on agreeing to China's scientific activities and offering facilitation. We welcome Philippine scientific research institutions' participation and would like to work with them to advance maritime practical cooperation in marine research and other fields so as to create a favorable environment for the sound, steady and sustainable development of bilateral ties. Q: Did Canada or the US invite China to take part in the foreign ministers' meeting on the Korean Peninsula situation. Why do you refuse to participate? Can you give us more details? A: I said just now that this meeting has not the slightest legality and representativeness to speak of. Just think about it. It is the 21st century, and everyone is concerned about and working towards properly and peacefully resolving the Korean Peninsula nuclear issue. But some parties dusted off the Cold War term of "UN Command" and convened a meeting where major parties to the Korean Peninsula nuclear issue are not represented. One has to question what they are going after. I want to repeat that this meeting has no legality and representativeness at all, and China has been opposing it all along. Q: What is the situation in the East China Sea because this morning, the CCTV said that the oil slick is expanding? A: We are also very concerned about any possible secondary disasters. I suggest you follow the updates on the website of the State Oceanic Administration. They did confirm that there has formed an oil slick. Relevant departments are monitoring the movement of the slick at sea and in the air. We would cooperate with relevant parties on this. I would refer you to competent authorities for more details. A piece of information for you. The State Oceanic Administration released some data yesterday on its website, including the coordinates where the tanker sank and the spread and movement of the oil slick. They made it clear that they would continue a multi-dimensional monitoring from the air and sea over the oil slick, closely follow the spread and movement of the oil slick, and evaluate its impact on the ecological environment. Q: Can you give us details of President Xi's call with US President Donald Trump today? 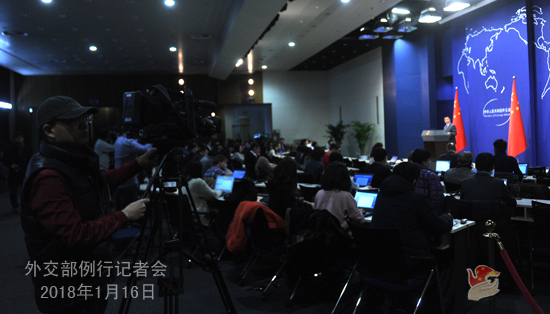 A: China has released the relevant information in a timely manner. This morning Beijing time, President Xi Jinping talked with President Donald Trump over phone at the latter's request, during which they mainly exchanged views on China-US relations and the current situation on the Korean Peninsula. Regarding China-US relations, both sides believe that their bilateral relations are quite important. In light of the fact that bilateral relations achieved overall sound and steady growth last year, the two heads of state discussed how to make good use of the four high-level dialogue mechanisms in the new year to enhance exchanges and cooperation in such areas as military, anti-drug campaign, law enforcement, trade, culture and people-to-people and sub-national interactions so as to move forward bilateral relations and cooperation. President Trump also said that the US side values its relations with China and US-China cooperation. The two leaders also discussed the issues concerning bilateral economic relations and trade. President Xi explicitly emphasized that China-US economic relations have delivered tangible benefits to the two peoples. It is inevitable for the two countries with such a big bilateral trade volume to have some differences and frictions in the economic aspect. What is important is for the two sides to focus on adopting a constructive way to expand their converging interests, enlarge the pie of cooperation and properly handle the economic and trade issues of common concern. President Xi also elaborated on China's views on the current situation on the Korean Peninsula upon request and pointed out that China welcomes the emerging positive signs on the Peninsula. We hope that all relevant parties of the international community could cherish and make good use of these positive signs to maintain the momentum of the improvement of DPRK-ROK relations on the Korean Peninsula and create more enabling conditions for the resumption of dialogue and settlement of the Korean Peninsula issue. President Trump also said that the US values China's important role in the Korean Peninsula issue and stands ready to maintain communication and coordination with the Chinese side in this regard. Q: The ROK foreign ministry spokesperson said today that the ROK is coordinating with the Chinese side on the attendance of the Chinese government envoy at the Pyeongchang Winter Olympics. Can you confirm it or do you have any information to release? A: The Winter Olympics is a world-class sports event. China supports the ROK government in holding the PyeongChang Winter Olympics. On the Chinese delegation's attendance at the Winter Olympics, we will release relevant information in due course. Q: This phone call took place after some weeks of continuous information in the United States concerning possible new trade restrictions being imposed in Washington against China's exports. So, does China think that after the telephone conversation, the risk or probability of these new measures in Washington is lower? A: As I said just now, the two heads of state during this morning's call Beijing time discussed how the two countries should make joint efforts to promote the further development of China-US relations, including the economic and trade relations between the two countries. As we all know, over the 40 years since the establishment of diplomatic relations between China and the United States, economic and trade relations have always been an important propeller and ballast for bilateral relations and have played an important role in promoting the development of bilateral ties. As President Xi Jinping made it clear during the call, over the years, the economic and trade cooperation between China and the United States has brought tangible benefits to the two peoples. As for some disputes that have emerged between China and the United States in the areas of economy and trade, as I said just now, it is not surprising that there will be some problems considering our trade volume. The key issue is how to handle differences in a constructive manner without affecting the overall economic cooperation or the bilateral economic and trade relations that have brought tremendous benefits to the people, businesses and industries of China and the United States over the years. During the call, President Xi made it clear that both sides should take a constructive approach to make the cake of cooperation bigger and properly solve the economic and trade issues of mutual concern via opening up their markets to each other. President Trump also said that the US would like to work with China to broaden cooperation in the pragmatic fields, properly handle the economic and trade problems and promote greater development of bilateral relations by strengthening high-level and all levels of exchanges. We have also noticed those voices in America concerning China-US economic and trade relations. A spokesman for the Chinese Ministry of Commerce last week elaborated on issues such as China-US trade balance and other economic aspects. I will not repeat them here. One point I would like to reiterate is that it would be impossible for the China-US economic and trade relations to keep progressing for nearly 40 years if they had not brought tangible benefits to the business communities and people of the two countries. As far as I know, the trade volume between China and the US in 2017 exceeded 580 billion US dollars. If it were not for the benefit of both sides, the China-US economic and trade relations would not be able to continue such positive and sustained development.